Paul called in from the Warfighter Sports/DSUSA team this evening from Camp 3 on Denali at 14,200 ft. They climbed from the 11,000 ft camp today, so it was a big move with big packs today. The route from Camp 2 to Camp 3 on the West Buttress Route ascends more steeply up “Motorcycle Hill” and around “Windy Corner” before continuing up into Genet Basin and the 14,200 ft Camp 3. 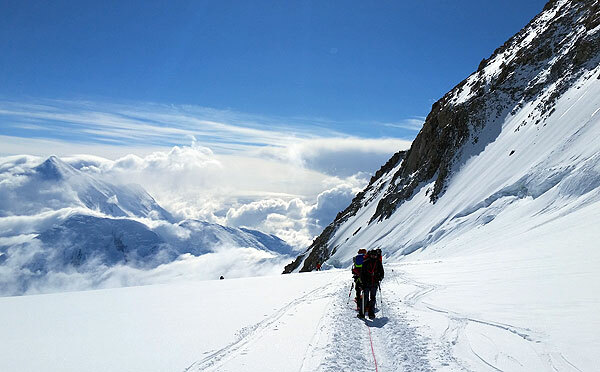 They climb roped up and with crampons on through this section, so it’s definitely a bit more like mountaineering than the strictly glacier travel section below Camp 2. A team climbs above Windy Corner, headed for Camp 3. It sounds like they had a good, but challenging day getting up to their new camp. Everyone is excited to be there, and it sounds like they are all having a great time up there! Here’s Paul with the evening dispatch from 14,200 ft on Denali.